Content marketers fight the daily battle of staying timely and ultra-relevant. Newsjacking is the process of injecting your brand into the day’s news, creating a twist that grabs eyes when they’re open widest. The term recently found notoriety from David Meerman Scott’s book of the same name. To be fair, the concept of newsjacking isn’t news — public relations professionals have done it for years. However, content marketers now have their own opportunity to turn the news to their advantage — and many of you are already doing so. Leading your market in thought leadership. You walk a fine line when you newsjack. So, what’s the right way to do it? For content marketers, newsjacking is about aligning breaking news with your brand and the content you create for it. Take a look at a few examples of brands that have done it the right way. 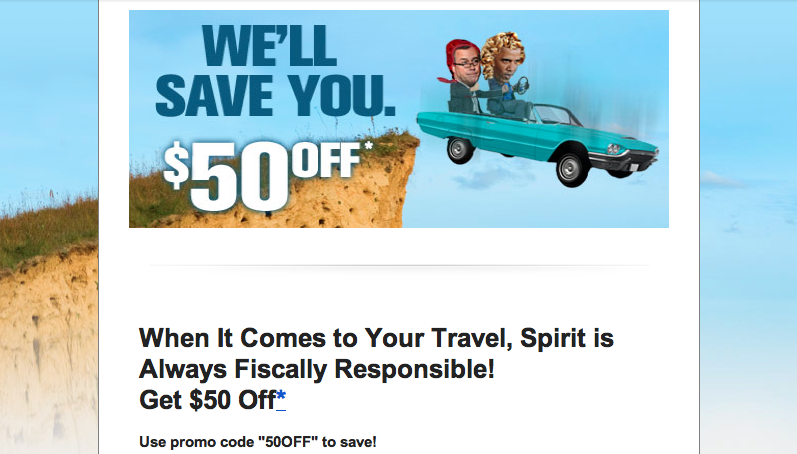 Say what you will about Spirit Airlines, but the marketing team is working overtime on drawing in return customers through email promotions. Over the last year or so, the discount airline has made headlines for its edgy, sometimes irreverent, subject lines and branded email content. In the past, Spirit newsjacked other notable events like the General Petraeus scandal, the presidential debates and election, the NFL replacement refs, and Illinois Gov. Rod Blagojevich’s trial and conviction. Even the National Football League maintains an active content marketing program through blogging and other channels. Granted, the NFL has no shortage of content to share with its audience —but it goes above and beyond anyway. The NFL’s Sidelines blog does its job covering your typical football-related stories. Recently, the NFL.com staff sidetracked its usual coverage to newsjack a hot topic — the announcement of Prince William and Kate Middleton’s new baby. 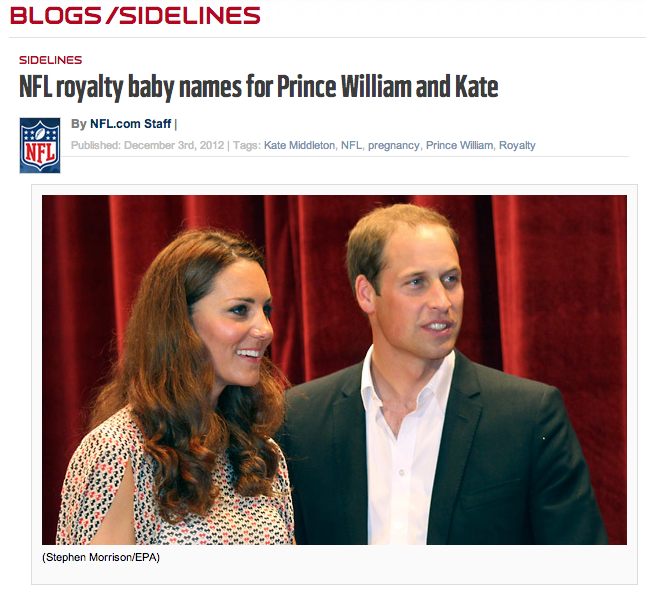 The blog post showcased the NFL’s most royal baby names. You walk a fine line dealing with negative news stories (especially tragedies). 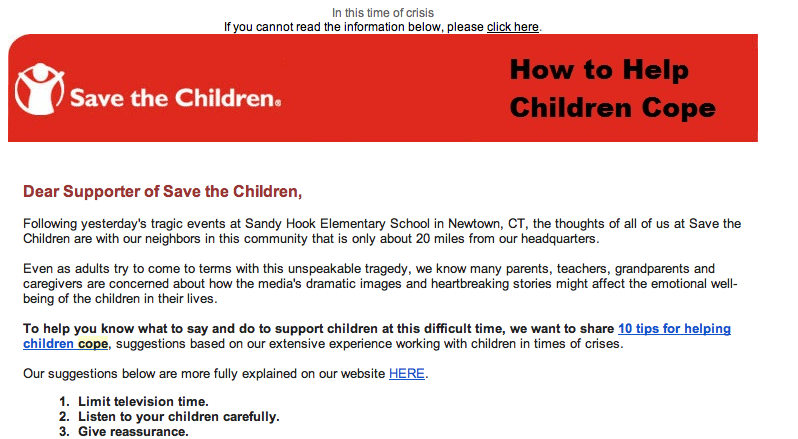 Save the Children offered help through its branded content in a graceful way. 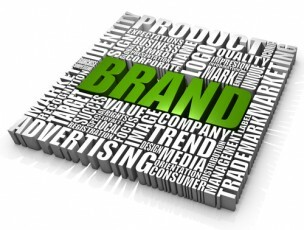 But many brands have stumbled, trading thoughtful decisions for ultra-relevance. You can learn from their mistakes. Ready to jump in? Hold on a second. There are things you need to know before you start newsjacking. Mistakes have been made, and best practices have been defined. Here are a few tips to get your program started on the right foot. Choose a handful of news outlets to watch. One should be a trusted industry-focused site. Another may be relevant to your audience. (For instance, if your audience is heavily rooted in pop culture, you may focus on a celebrity news site.) Finally, monitor local and national news sites. Before you newsjack a story, make sure you double-check its veracity with other outlets. Be very discerning: A military coup, the death of a celebrity, a natural disaster — these are not events of which you should take advantage. Newsjacking requires enhanced sensitivity — a characteristic that some major brands have demonstrated they don’t have. Just how many people might you be competing with? Do a quick BusinessWire search on “Hurricane Sandy.” Up pop 46 pages of press releases — and new releases are still appearing every day. Make sure the news story has some kind of relevance to your content. Reaching for tough connections will make writing harder and the content tougher for readers to swallow. Take a constructive angle: Especially in the case of a disaster or tragedy, newsjacking requires a positive spin. Who can forget Kenneth Cole’s infamous mind-numbing reaction to 2011’s conflict in Cairo? The brand tweeted: “Millions are in uproar in #Cairo. Rumor is they heard our new spring collection is now available online…—KC.” That’s an example of short-form newsjacking gone seriously wrong. Include keywords: One of the primary goals of newsjacking is ramping up visibility for your content. Make sure to include relevant keywords to improve search rankings. These keywords may relate to the news story itself if it’s a smaller trending item, perhaps relevant to your industry only. As you do with other branded content, it’s also smart to focus on the keywords you’re trying to dominate for general search ranking. When performed properly, newsjacking becomes a subtle yet eye-catching tool in your content marketing arsenal. But the practice has caused quite a bit of controversy. Do you think there’s room for the practice in your content marketing? Share your thoughts with us in the replies. Looking for more info on the latest trends in content marketing? Read the CMI Book, “Managing Content Marketing” by Robert Rose and Joe Pulizzi.